After a year off, the pop-up town of Winterville heads south of the river to Clapham Common, from 23rd November – 1st January. We’re delighted to announce that we are partnering with them for this years Christmas fun and will also be there on selected Saturday’s throughout November and December, hosting LittleBird’s Kids Quarter where you can enjoy creative family fun and get glittery with Santa’s elves! Expect brilliant entertainment for all ages at Winterville: skate on Clapham Common’s first-ever Ice Rink, enjoy sensational street food from Street Feast, watch screenings of Christmas classics in Backyard Cinema’s Winter Night Garden, play crazy golf on the UV-powered Plonk Golf course, ride the Big Wheel and grab gifts from the alternative Christmas market. The Street Feast area will feature some of London’s best street food traders including Up In My Grill, Mother Clucker, Petare, SE Cakery and many more. The Spiegeltent will host plenty of FREE entertainment including an opening weekend set from Norman Jay MBE and free shows from Guilty Pleasures, Ultimate Power, South London Soul Train, R&She with All Saint Mel Blatt, Gin & Juice, Indeedy Musical Bingo and the Winterville Orchestra & Choir. Ticketed shows include Cirque du Cabaret and Mexican Wrestling from Lucha Britannia, while Sunday nights see Sink The Pink Presents The Merry Marys, Little Gay Brother and Mariah & Friends take to the stage. The Twisted Wheels Roller Disco will feature nights from 2 Bears, Erol Alkan’s Disco 3000, Stevie Wonderland and Throwback Events, as well an All-Abba Disco and a Studio 54 Special. There’s also loads for kids to do. 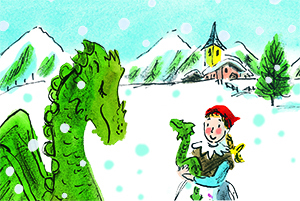 As well as the Ice Rink, Cinema, Fairground and Roller Disco, there’s a live adaptation of Mimi & The Mountain Dragon from War Horse creator Michael Morpurgo, a family rave-up with Big Fish Little Fish, the World Beyond the Wardrobe immersive experience from A Tea Dance For Little People, plus our very own Santa’s Workshop. Winterville is brought to you by the teams behind Field Day and Street Feast. For more information, tickets and opening times head to: winterville.co.uk. See LittleBird’s Winterville offers and find out more about our pop-up Kids Quarter here.